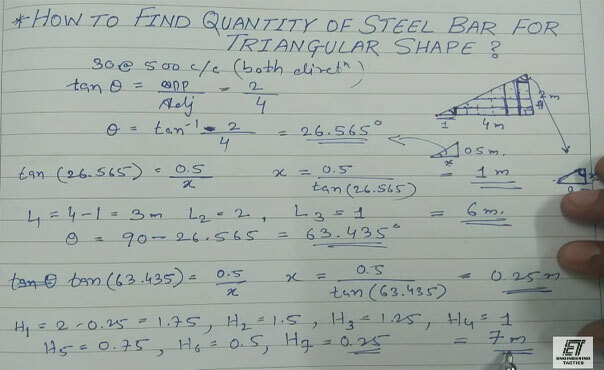 Get some useful tips required to work out the quantity of steel bar in a triangular shape in kg or meter. The calculation is done based on the following data. The length of the triangular shape is taken as 4 meter and the height is taken as 2 meter. Inside the triangle, the steel bars will be placed as horizontally and vertically. The diameter of the steel bars is 30 mm @500 c/c in both directions. The calculation is done by applying two methods like with angle or without angle. Here, the length and height of the each bar will be reduced successively. Now, it is required to find out the length of the bar in horizontal direction. Now draw line maintain 90 degree angle. Thus, a small triangle will be formed. Now, deduct this length from the length of the other steel bars successively. By summing up, the total length will be 6 meter. Repeat the above process to find out the length of the steel bar in vertical direction. For more details, go through the following video tutorial.